The 2016 Intel Developer Forum has wrapped. 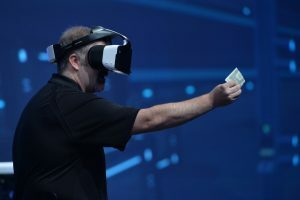 If you were among the more than 6,000 participants, you had a front-row introduction to the Project Alloy virtual reality headset, the Intel Joule module and the now-available Silicon Photonic transceivers – among other new products. You also learned about Intel’s announcement that ARM is a new ecosystem partner with Intel Custom Foundry. Attendees look at Intel products at the 2016 Intel Developer Forum in San Francisco on Tuesday, Aug. 16, 2016. PRESS KIT: 2016 Intel Developer Forum Press Kit: Keynote videos (replays and B-roll highlights), links and product fact sheets. PHOTO GALLERIES: 2016 IDF Photo Galleries: Downloadable photos from three days of events, keynotes and product launches. “Here’s Why Intel and AT&T Are Becoming Best Friends” (Fortune): On Wednesday at Intel’s annual developer conference, Intel and AT&T said they were deepening an existing partnership that involves AT&T getting early access to new Intel technologies and jointly working on networking infrastructure problems specific to the carrier’s needs. The two companies have already created a technology team of 50 engineers that is attempting to fine-tune Intel’s chip technology to work more efficiently with AT&T’s custom networking software that it plans to make publicly available for free. 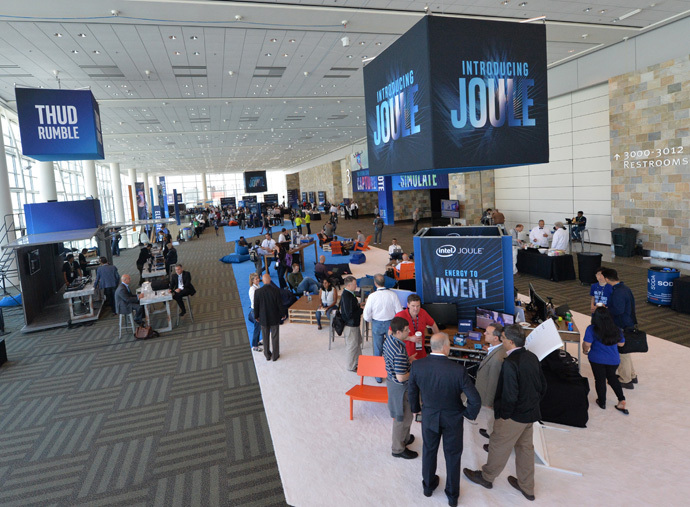 “Best New Tech from IDF 2016” (Intel IQ): It looks like the world’s largest geekfest, but the six thousand change makers who attend the Intel Developer Forum 2016 in San Francisco see it as a giant springboard into the digital future. “Each autonomous car will one day generate more data than thousands of people” (Mashable): There’s going to be a ton of information flying around in the near future, and humans aren’t going to be the only ones generating it. Your car will send and receive location data, check in on the weather, navigate traffic and so on. “Autonomous Cars: The Road Ahead” (Intel IQ): At the Intel Developer Forum 2016, developers are key to shaping the digital future. 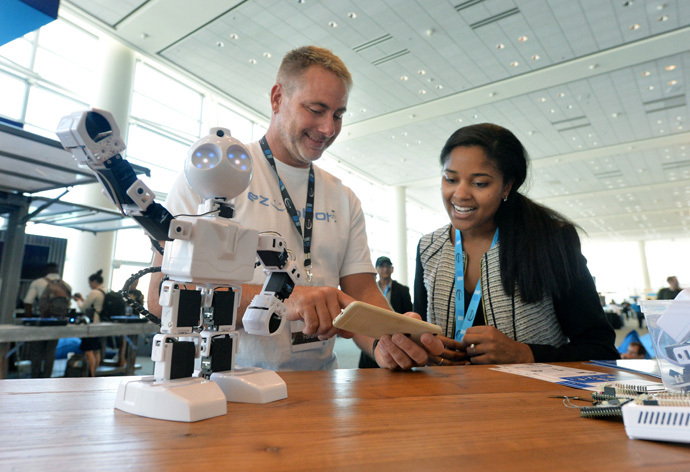 DJ Sures (left) with EZ-Robots talks with Intel’s La Tiffaney Williams about robots that utilizes Intel’s Joule module at the 2016 Intel Developer Forum in San Francisco on Tuesday, Aug. 16, 2016. “Intel Lifts Curtain On New Joule Module, A Game-Changer for The Internet of Things” (CRN): Intel Tuesday placed even more bets on the Internet of Things with the introduction of its Joule platform, a module built for IoT applications by packing a high-performance system-on-module into a low-power package. “Intel challenges Raspberry Pi 3 with tricked out Joule board” (PC World): Intel has unleashed a new competitor to Raspberry Pi 3 with its new Joule development board, which packs in superior graphics and wireless connectivity. The chipmaker has loaded the development board with technology found in regular PCs: a 64-bit quad-core Atom processor, 4K graphics, 802.11ac connectivity, and DDR4 memory features. … The Joule will provide big-time computing power for robots, drones, smart devices, and wearables. “Intel’s Joule is its most powerful dev kit yet” (Engadget): The company says the tiny, low-powered Joule would be ideal for testing concepts in robotics, augmented reality, VR, industrial Internet of Things, and a slew of other categories. And it also looks like it could be an interesting way for students to dabble in RealSense’s depth-sensing technology in schools. “Intel to put its brand on Stratix 10, ship by the end of the year” (ZDNet): Brian Krzanich showed the audience at the Intel SoC Developer Forum the first Intel-branded Stratix 10 FPGA. Stratix 10 will be the first Intel manufactured FPGA based on its 14nm process technology, following the acquisition of Altera. This brand transfer from Altera to Intel represents a significant milestone in the acquisition. “Intel to Accelerate Altera, Says CEO” (EE Times): Brian Krzanich, during his keynote at the Day 3 Intel SoC FPGA Developer Forum (ISDF), highlighted to the audience Intel’s vision and strategy for FPGAs and SoC FPGAs. This vision includes Intel’s investment in, and growth of, the FPGA business through the development of discrete FPGAs and SoC FPGAs which integrate both ARM and Intel Architecture. Brian also reiterated Intel’s support for FPGA customers, by continuing to deliver the same levels of outstanding service they received from Altera, and continuing to support long FPGA product life cycles. Intel’s Craig Raymond displays the Project Alloy virtual reality headset during the Day 1 keynote at the 2016 Intel Developer Forum in San Francisco on Tuesday, Aug. 16, 2016. Intel CEO Brian Krzanich’s keynote presentation offered perspective on the unique role Intel will play as the boundaries of computing continue to expand. “With Its Project Alloy Headset, Intel Wants To Usher In The Era Of ‘Merged Reality’ “ (Fast Company): The company announced a headset platform called Project Alloy, and explained “merged reality,” a term it has coined to describe the experience that Alloy is capable of creating. Despite being from Intel, Alloy – unlike the Oculus Rift and HTC Vive – is distinguished in part by the fact that it doesn’t rely on a PC for processing power. Instead, it’s self-contained, with everything required to create the experience built into the goggles themselves. “ ‘A.I. is still rather nascent,’ says Intel executive Diane Bryant” (VentureBeat): Last week Intel made a bold move and acquired Nervana, one of the preeminent startups in deep learning, a type of A.I. that involves training artificial neural networks on data and then getting them to make inferences on new data. Today, when Intel announced a new generation of Xeon Phi server chips, the emphasis was on their ability to handle A.I. workloads. Clearly, the company’s interest in the area is on the upswing — following a considerable A.I. push from graphics card maker Nvidia. “The world of A.I. is still rather nascent,” Diane Bryant, executive vice president and general manager of Intel’s Data Center Group, told VentureBeat. “Intel Unveils Upcoming Xeon Phi Chip Aimed at AI Workloads” (eWeek): At the Intel Developer Forum here Aug. 17, company officials said they will continue their efforts to make the chip maker’s x86 products the foundational silicon for the job of training the neural networks driving the development of artificial intelligence (AI). The combination of Knights Mill — a derivative of the current Xeon Phi Knights Landing chip aimed at the AI space — and the presence of Baidu on the IDF stage is another boost for Intel as it looks to gain more traction in the rapidly growing AI and machine learning space, according to Patrick Moorhead, principal analyst with Moor Insights and Strategy. “Intel Plans 5G Trials in 2018, Commercial Deployment in 2020” (PC Magazine): Intel has repeatedly said it is committed to 5G and IoT, in no small part because its most valuable customers are demanding that commitment. It will begin 5G trials in 2018, and plans commercial deployment by 2020. … “The shift to 5G will be as profound as the shift from analog to digital,” said Murthy Renduchintala, Intel’s IoT president. “IDF 2016: Intel lays out its 5G, IoT strategy” (ZDNet): “5G is really about the machines,” Sandra Rivera, vice president of Intel’s Data Center Group, said at the Intel Developer Forum in San Francisco on Tuesday. “The tens of billions of machines and sensors that will connect and create the fabric of our future networks.” At IDF, Intel demonstrated in multiple ways how it’s aiming to provide the processing power for those machines. The chipmaker introduced multiple modules designed for all sorts of IoT applications. 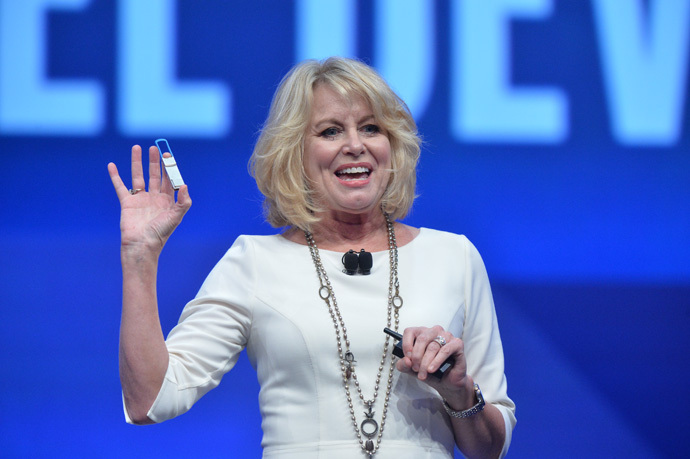 Diane M. Bryant, Intel executive vice president and general manager of its Data Center Group, announces at the 2016 Intel Developer Forum in San Francisco on Wednesday, Aug. 17, 2016, that the first Intel Silicon Photonics 100G optical transceivers are commercially available. During her keynote, Bryant spoke of the demand on connectivity in an increasingly connected world. “Intel: Our laser chips will make sites like Google and Facebook faster” (CNET): Laser light has made its way into a new product line Intel expects will speed up the data centers at the heart of online services like Google search and Facebook social networking. After years of research, the chipmaker has begun selling a product using a technology called silicon photonics that builds lasers directly into computer chips. That means communications can take place using light traveling over glass fiber-optic cables that can carry much more data than electrons on traditional copper wires. “Intel debuts silicon photonics module for lightning-fast connectivity in data centers” (VentureBeat): Intel is launching a new silicon photonics product that will make it a lot easier to hurl data around data centers at tremendous speeds. The Intel PSM4 silicon photonics module can deliver 100 gigabits per second across two kilometers, making it easier to share data at high speeds across the “spine” of a data center. The technology is the result of years-long efforts to bring both electronics and optical components onto a single piece of silicon, which is lower cost and easier to make. “Intel’s new computer can serve as the brains of robots” (PCWorld): A compact computer called Euclid from Intel should make the development of robots much easier. Euclid looks much like the Kinect camera for Xbox consoles, but it’s a self-contained PC that can be the guts of a robot. It’s possible to install the Euclid computer where the “eyes” of a human-like robot would be typically placed. … Euclid has a 3D RealSense camera that can serve as the eyes in a robot, capturing images in real-time. It has motion and position sensors that can help the robot move around both indoors and outdoors. “Intel’s Candy Bar-Sized Euclid RealSense PC And Joule Devkit Empower Our Robot Overlords” (HotHardware): One of the more interesting products announced this morning was Euclid, which manages to incorporate a fully self-contained PC into a device that is the size of a candy bar and runs Ubuntu Linux and Robot OS. Euclid even has its own internal battery, which allows it to function on its own without a tether. Onboard is one of Intel’s RealSense cameras, which [Intel CEO Brian] Krzanich says “brings sensors to robots.” Playing up on the statement, Euclid was installed into a small robot that took the stage at IDF. The robot had been preprogrammed to use its RealSense camera to follow someone around; sort of like your own miniature paparazzi, only less annoying. “Intel Licenses ARM Technology to Boost Foundry Business” (Bloomberg): Intel Corp., the world’s biggest semiconductor maker, said it’s licensing technology from rival ARM Holdings Plc, a move to win more customers for its business that manufactures chips for other companies. The two chipmakers, whose designs and technology dominate in computing and mobile, unveiled the agreement Tuesday at the Intel Developer Forum in San Francisco. The accord will let Intel offer third-party semiconductor companies its most advanced 10-nanometer production lines for manufacturing the complex chips usually used in smartphones. “Intel Foundry Rounds Out IP Lineup With ARM, Adds New Customers AT IDF 2016” (Forbes): The ability to fab ARM Holdings processors in the traditionally x86 Intel fab comes from a partnership between Intel and ARM that includes ARM’s Artisan Physical IP platform. This means that Intel has access to ARM’s high performance and high density logic libraries as well as their memory compilers and POP IP. While Intel has had the ability to fab an ARM-based part, the addition of the Artisan IP makes it easier. 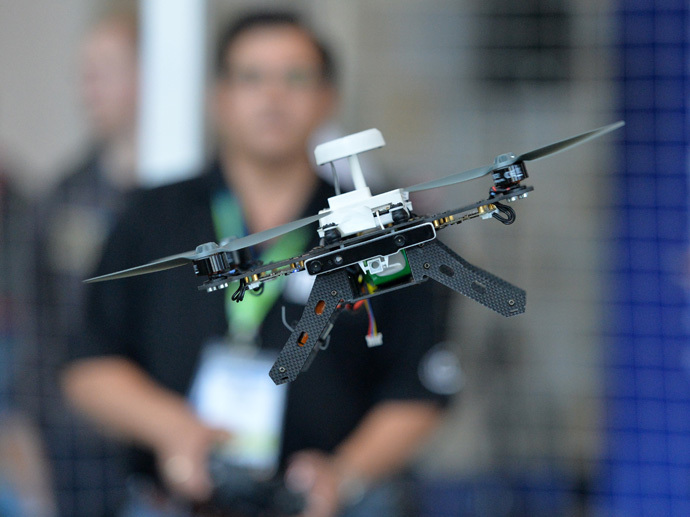 A ready-to-fly drone that uses Intel’s Aero Compute Board and RealSense technology is flown during a demonstration at the 2016 Intel Developer Forum in San Francisco on Wednesday, Aug. 17, 2016. “Intel’s Drone Aspirations Take Flight With Project Aero” (PCMag): In a specially designed “Drone Cage” established on the second floor of the Moscone Center, Intel held multiple demonstrations throughout the day of the Ready To Fly Drone in action. Though limited space precluded the possibility of any fancy aerial tricks, the (obviously experienced) drone pilot showed how the Ready To Fly model was just as flexible and maneuverable as larger models. Considering this was the base platform model, it stands to reason that creative and enterprising developers will be able to spin off Aero into even more visually and technologically exciting directions in the months to come. “Intel fires up 5G engines” (The Australian): Intel is gearing up to power the “post-smartphone era” with the US giant lifting the lid on the role it’s going to play in the 5G revolution. The chipmaker has used its Developer Forum in San Francisco to outline its plans for the next few years, with Intel’s general manager of 5G business and technology, Rob Topol, telling The Australian that the advent of 5G would be a “major inflection point” for the telecommunications industry.